The more films I see from Japanese master Mizoguchi Kenji, the more convinced I am that had I grown up with the man and become his close friend, I'd have swum the Pacific in a bamboo kimono before agreeing to go on a date any girl he tried to set me up with. That's no reflection on the director's taste in women, but on the fate repeatedly suffered by seemingly well matched couples in Mizoguchi's cinema. It's hard not to be struck with a sense of impending trouble from the moment Shinnosuke first claps eyes on the regal and recently widowed Oyû Kayukawa, whom he mistakes her for her sister Shizu, the woman being presented as a potential bride for this indecisive and difficult-to-please young man. As with so many of her predecessors, Shizu is not quite what the boy is looking for, much to the frustration of his increaringly impatient aunt, who has inherited the duty of seeing him married and settled. Is there no woman out there who meets with Shinnosuke's approval? Well there is one, as it happens, a certain widow who is not yet free to remarry. Want to guess who? But that's just the start of Shinnosuke's problems. When he discovers Oyû suffering from heatstroke in the street one hot day, he takes her to a friend's house to recover and, bewitched by her unconscious beauty, he come perilously close to kissing her. By now aware of his interest in her, Oyû nonetheless requests that he marry Shizu. Willing to do anything that will make Oyû happy, Shinnosuke agrees, but no sooner has he done so than Shizu begs that they observe the formalities of marriage only, believing as she does that Shinnosuke is secretly in love with her sister and has agreed to the marriage only to enable him to be near to her. Clear reasoning for Shizu's actions are not supplied by the film but are in Tanizaki Jun'ichirô's source novella Ashikari (The Reed Cutter). Here Oyû is painted as a someone who from an early age was treated by her parents as a princess and whose regal nature and warm demeanour have led others to do likewise; this was a woman you couldn't help wanting to do something for if you were able to get close to her. The younger Shizu's devotion was such that she would do anything to make her sister happy and would always put Oyû's welfare before her own. Thus her actions here are not those of a woman disappointed by marriage or her new husband's love for another, but an act of devotion to a woman she idolises. For Shizu, to sleep with Shinnosuke would be tantamount to betrayal. The three thus find themselves in a tricky situation with no easy resolution. Effectively slaves to the expectations of society, family, and their own self-image, all three appear destined to live unhappy lives behind masks of respectability and convention. Oyû in particular maintains the front of emotional detachment expected by her family, which prior to her sister's marriage falters only momentarily when she wakes from her heatstroke and assesses her situation, only to return the instant Shinnosuke becomes aware of her recovery. For Shinnosuke, the situation is one rife with frustration and disappointment, denied the woman he desires by social convention and the woman he is married to by her own sense of self-sacrifice. 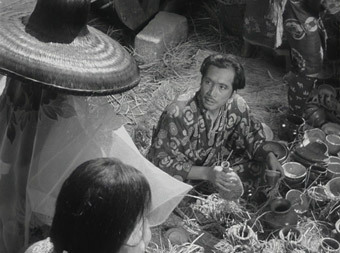 As with many of Mizoguchi's works, there is the sense from an early stage that the story is unlikely to have a happy ending. A momentary belief that with the passing of time the three have found their arrangement mutually agreeable is quietly shattered when a hotel maid mistakes Shinnosuke and Oyû for the married couple, prompting the immediate return of their social discomfort. 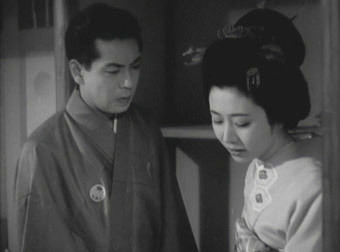 The family influence is never too far away either, with disapproving words exchanged over Oyû's sunstroke recuperation in Shinnosuke's company, and plans immediately made for her remarriage to another when her son falls fatally ill.
As with the director's 1954 Chikamatsu monogatari, there is a clear kabuki influence in the positioning and movement of actors within locations, though Mizoguchi's use of long takes, drifting camera moves and sometimes extraordinary wide shots are put to very effective use here, contributing to a work that is sometimes theatrical in its staging but always cinematic in its presentation. 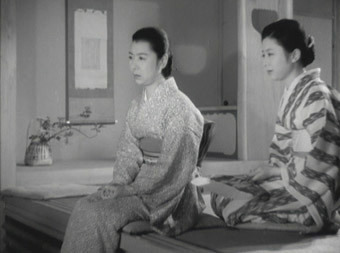 It's a film that Mizoguchi himself was apparently unhappy with, not least for the studio-enforced miscasting of Kinuyo Tanaka as Oyû-sama, an actress of considerable skill who nonetheless does not capture the stoic elegance of the character as written – a Japanese friend who knows the novel well was complaining about this within minutes of her first appearance. It may be a testament to Mizoguchi's greatness as a filmmaker that a work he was dismissive of and which suffered casting and structural interference from the studio still makes for unwaveringly gripping drama. For many of us the social restrictions under which the characters suffer here are an almost abstract concept, but I for one found it easy to empathise with Shinnosuke's frustration, his desire for things that in a fair world should be straightforward but which are denied him by the absurdities of convention and the attitudes of others. Few of us will have to look too far to find a modern western equivalent that has touched our own lives, and that maybe have affected us more than we care to admit. My first viewing of Ugetsu monogatari, which was also my first exposure to the work of Mizoguchi Kenji, was a peculiar blend of the sublime and the surreal. We had arranged a film society screening at our local cinema, but unbeknown to us their rather ancient 35mm projector only had two lenses, one for anamorphic scope prints and one for matted widescreen 35mm. They didn't tend to show films whose 1.37:1 aspect ratio used the entire 35mm frame, and when they did it meant cropping the top and bottom of the picture. Oh if only we'd known. As the film rolled, the subtitles that had been printed quite low in the frame were pushed off the bottom of the screen. A hasty dash to alert the projectionist saw the framing racked up to include the previously missing text, but with the unfortunate result that in almost all of the mid and long shots most of the characters were now missing their heads, which is how the rest of the film unfortunately played. An extremely distracting presentation at best, this glitch was initially misinterpreted by a friend of mine, who assumed that this was an unusual but deliberate approach to telling a cinematic ghost story. And yet despite this ludicrous presentation I was blown away by the film. An academic study of Mizoguchi's cinema, one that examined the films by their content alone, might struggle to identify just what it was that makes Ugetsu monogatari the director's masterpiece. There are several themes, character arcs and story elements here that you'll find elsewhere in the director's oeuvre, so what is it that makes this one so special? If you're pondering that very question then I have one piece of advice for you: just watch it. All will become clear. You may not emerge with a beaming smile on your face, but you'll still be richer for the experience. As you've probably gathered by now, Ugetsu monogatari is one of those infrequent films that prompts me to go dizzy with joy for the medium and to cheerfully excuse myself from any attempt at objectivity. In 16th century feudal Japan, village potters Genjuro and his brother-in-law Tobei both have ambitious dreams, Genjuro to strike it rich selling his wares in the nearby city, Tobei to become a samurai of some repute. While fortune initially smiles on Genjuro when his first pots sell quickly, Tobei's hopes of joining the warrior class are met only with scorn from those he pleadingly approaches. When their village is ransacked by raiders, Genjuro's kiln is left miraculously untouched and the two men head to the city with their wives and Genjuro's young son Genichi in tow. It's journey on which the fortunes of all five are destined to be changed forever. Ugetsu monogatari confirms beyond question Mizoguchi's command of both the poetic and narrative possibilities of the film medium and his ability to combine to the two to arresting effect. The main characters are quickly established and the early scenes developed at an almost breathless pace, reflecting both the energetic drive of the two male leads and their fear as they hide from the invading marauders. Then, as the group flee with their wares across mist-shrouded waters, there is a striking change of pace and mood. In one of the film's most justifiably celebrated scenes, the group run across a fatally wounded man who gasps out a warning of the dangers that lie ahead, of pirates who ransack goods and kidnap women. It's a hauntingly realised and visually astonishing encounter, one whose other-worldly atmosphere provides a semi-surreal foretaste of the supernatural arc the story will later take, and whose fateful nature is later illustrated by the dramatic consequences of the decisions made here. Not for the first time, Genjuro is torn between ambition and family and once again misjudges his priorities, reasoning that the danger ahead would be too great for his wife Miyagi and their young child to face, but worth him braving for the riches it may bring. Miyagi protests the decision ("Why do men never listen?" complained my Japanese friend, not for the first time when watching a Mizoguchi film), but she and Genichi are deposited by the riverside anyway and advised to take the mountain route home. "These misfortunes will soon be over," Genjuro assures her, "just be patient." For anyone not familiar with Mizoguchi's cinema, the almost immediate transition to the city of Genjuro's destination would suggest that his decision was sound and that we can now put Miyagi and Genichi safely out of our minds and concentrate on his story. This kicks off immediately with the hotcake-speed with which his wares are purchased and the request by the mysterious Lady Wakasa for him to deliver the goods she has just purchased to the Kutsuki manor. Tohei's dreams of warrior glory have meanwhile been revived by merchant stalls selling a range of armour and weaponry. So fired up is his passion that he doesn't even acknowledge the protestations of his wife Ohama, which has rapid and terrible consequences of which he remains tragically ignorant. All four adults are dealt a dark hand by fate but of varying severity and speed. In Tohei's case it arrives under the initial guise of success and respectability, as good fortune sees him realise his dream of becoming a respected warrior, only to be later confronted with the personal consequences of his earlier selfishness. Genjuro, meanwhile, finds himself increasingly and unhealthily devoted to Lady Wakasa, a figure whose very name appears to inspire a Dracula-like terror in the local populace. No plot summary, no matter how detailed, could convey the pure magic of Mizoguchi's handling of this compelling and complex story strand. The rapid pacing of the early scenes gives way to an eerie stillness when in the grounds of Kutsuki manor, but without for a second disrupting the narrative flow. The shifts in genre are handled with similar dexterity, being a jidaigeki (period drama) that develops a supernatural thread rather than an all-out ghost story, a thread that grows organically from the drama in a manner that feels as grounded in reality as the civil war background against which it is set. 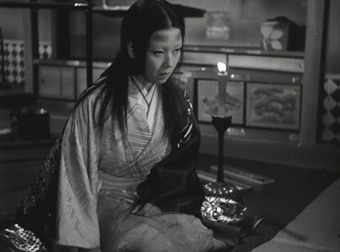 This is partly achieved by the avoidance of visual trickery in the handling of the ghostly Wakasa, whose unearthly nature is communicated though a skin-crawlingly unsettling use of facial expression, body language and vocal delivery on the part of actress Kyô Machiko, aided immeasurably by her Noh-inspired make-up and the mournful wails of Hayasaka Fumio's exquisitely haunting score. 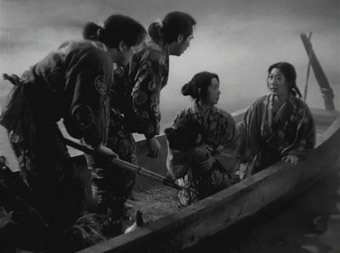 The narrative is divinely structured, diverging into four separate stories of unequal screen time and differing styles, which then reconnect beautifully in the final act, Genjuro's encounter with Wakasa leading to an appropriate conclusion in which the darker supernatural aspect of his story is inverted to heart-rending effect. Like these varying narrative strands, everything about Ugetsu monogatari works in a cinematic harmony, each element remarkable in itself but never overshadowing the other, from Miyagawa Kazuo's gorgeous monochrome cinematography to the pace and drive of Miyata Mitsuzô's purposeful but near-invisible editing. But Ugetsu is rightly celebrated above all else because we care so deeply for its characters and the varying fates that befall them, for their physical suffering and their emotional pain, right through to the extraordinarily moving finale. Their life lessons are hard learned but are as relevant today as they ever were, and are so seamlessly integrated into the narrative that they never feel preachy, being absorbed by the viewer through a process of cinematic osmosis. There's no two ways about it – if you're looking for one film that defines Mizoguchi's greatness as a film artist, that encompasses all of the elements that make his cinema so compelling and incite such a passionate response from his many admirers, then Ugetsu monogatari is it. As with previous Masters of Cinema releases of Mizoguchi's work, both films have undergone restoration from imperfect original material, though Ugetsu definitely fares better here. Damage is still very visible on both prints but has been knocked back and cleaned up, though does briefly break out into a rain of dust at one point on Oyû-sama, presumably at a previous reel change. The detail and contrast on both are at their best very good, but there is some contrast variance on both transfers and just occasionally the black levels slip to grey. Although the print condition on Ugetsu monogatari is similar to that on the Criterion US release, it has to be said that the contrast and black levels on the Criterion transfer are more consistent. The soundtrack betrays its age on both films, with fluff and crackle present throughout, though are only really evident in quieter scenes and do vary over the course of both running times. For the record, the soundtrack on the Criterion Ugetsu is of similar quality. Two typically interesting introductions from the knowledgeable Mr. Rayns, who usefully provides background detail to both films rather than analysing them. Particularly revealing, given Ugetsu's phenomenal standing, is the information that Mizoguchi was satisfied with neither film, and that Ugetsu won the Silver Lion at the Venice Film festival in a year when no Golden Lion was awarded because the jury didn't see a film that in their opinion deserved it (other films in competition that year, it should be noted, included Fellini's I Vitelloni and Sam Fuller's Pickup on South Street). Showing a lot of damage but intriguing, not least for the misleading score, which at one point plays like that of a rip-roaring adventure. An oddly framed scope trailer in surprisingly good shape with a particularly unexcited voice-over. You'll need your best spectacles to read the microscopic typeface in this booklet's packed 64 pages. A richly detailed essay on Ugetsu monogatari and a shorter piece on Oyû-sama by Keiko McDonald are joined by translations of The Reed-Choked House and A Serpent's Lust by Ueda Akinari, the two stories on which the script for Ugetsu monogatari was based, both translated here by Anthony H. Chambers. They make for a fascinating read, particularly in context of their adaptation within the film. It should be noted that the same two stories translated by Chambers also appear in the handsomely presented booklet accompanying the Criterion release. My favourite Mizoguchi film is teamed here with a fascinating lesser work, which in some ways make this the most essential yet of Masters of Cinema's Mizoguchi double-bills. Passionate fans of the director's work will no doubt already have the Criterion disc of Ugetsu, and to be honest it's the superior release, having a more consistently impressive transfer, a commentary by Tony Rayns, a 14 minute appreciation of the film by director Shinoda Masahiro, a 20 minute interview with the film's first assistant Tokozu Tanaka, a 10 minute 1992 interview with cinematographer Miyagawa Kazuo, and a 150 minute documentary on Mizoguchi by Shindo Kaneto. But Mizoguchi fans will still want this package for the rarely seen Oyû-sama, and if you haven't picked up the Criterion Ugetsu yet, are not worried about those extra features and can tolerate the occasional shifts in contrast, then this is a must. But I'd still give that Criterion release a serious look.